Graduated from the Academy of Fine Arts, Helsinki, Finland 1992. MA Academy of Fine Arts, Helsinki 1996. 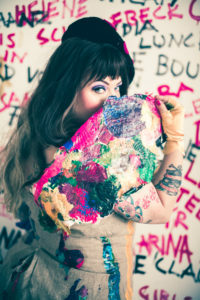 Works with painting, drawing, animation, burlesque, performance art. Producer of the Helsinki Burlesque clubs, shows and happenings since 2007, brought international burlesque to Finland and introduced it to the contemporary art scene. Solo- and groupexhibitions, videofestivals and screenings in Finland, Europe, United States and Japan since 1992. Teacher in different artschools in Finland and Sweden since 1992. Burlesque instructor and lecturer, headmistress of BurleskInstituutti. Performative artguide Leila Halkeama. Student of interior design at Stadin Aikuisopisto since autumn 2017.